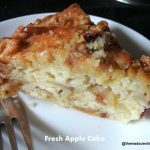 When I made this Fresh Apple Cake the aroma filled the house. The cake is a moist and filling cake. My elder one did not want to wait for the cake to cool down. 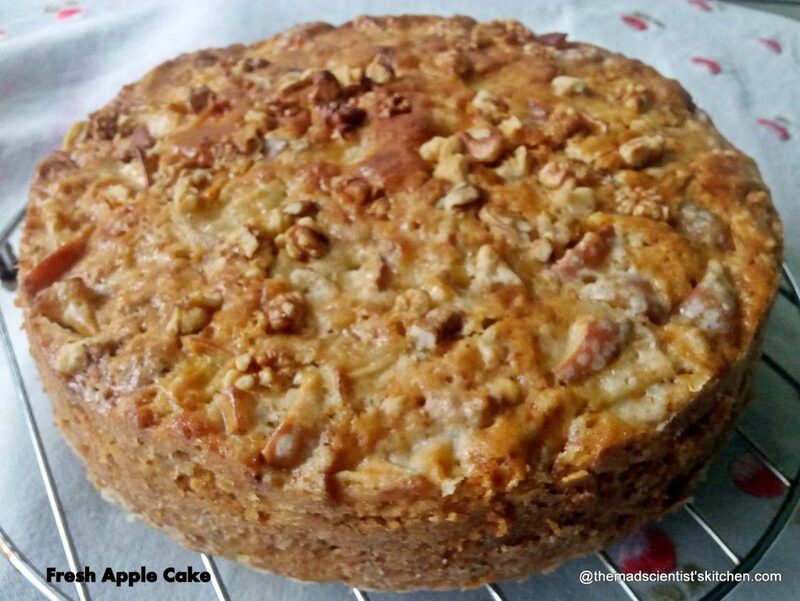 Apple cakes are popular dessert and the main ingredient being apples. The fruit is sliced then added to the batter. Traditionally spices like nutmeg and dalchini/cinnamon are used. Add nuts like almonds or walnuts and you have a yummy cake that is simple to make yet satisfying. There are 3 more cakes I want to try out hopefully as long as I am on leave I will be able to make them. Apples and applesauce are used in making cakes as they help their water-retention helps in making a moist cake. The other apple cake I have made are Apple Upside Down Cake, Eggless Applesauce Chocolate Cake. But use apples to make Carrot, Apple and Orange Smoothie, Easy Baked Apples, Plum and Apple Cobbler, Apple Pie. This cake is adapted from here. Preheat oven to 180°C/350° F (175 degrees C). Grease and flour an 8 inch round pan. In a bowl mix, the sugar and apples set aside. Set aside a few nuts to top the cake. Sift together the flour, baking powder, dalchini/cinnamon(if using) and salt. In a large mixing bowl, stir together the oil, eggs and vanilla. Mix well the apples and sugar. As my batter seemed a bit dry I added 2 tablespoons of milk and mixed it well along with the nuts. Transfer the mixture to the prepared pan and spread evenly. Sprinkle the reserved nuts and bake in the preheated oven for 45 minutes or till the toothpick inserted in the centre comes out clean. 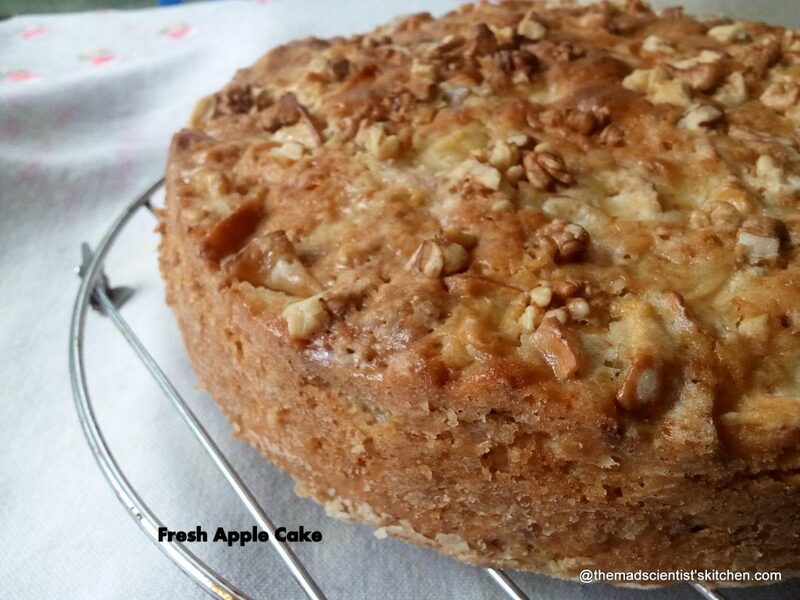 Delicious apple cake made from fresh apples and loaded with nuts! Preheat oven to 160°C/320° F.
Mix the apples and sugar well and set aside. The picture itself says how beautifully it has baked.. Loved the generous amount of yummy walnuts on top of the cake. Divine! OMG.. this cake is to die for.. it has got such a rich texture. Feel like grabbing a slice right away. Such a filling cake. 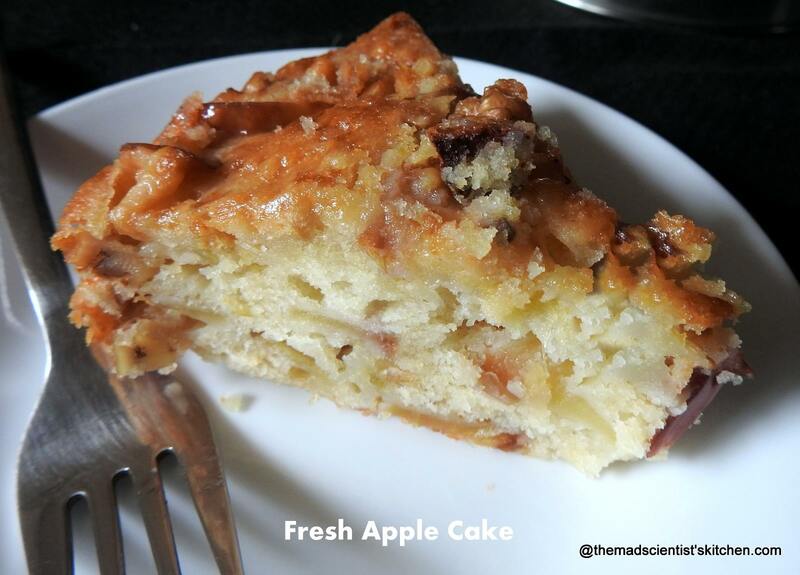 A slice of cake is good enough for the tea time..
Wow, fresh apple cake looks so moist and tasty. I am in love with that crumb, so amazing.